Weather Report: Low 33, High 74. Partly cloudy, breezy at first, then calm. It looked like it was going to rain, but never did. It rained off and on through the night, and my tent was very soggy by the time I woke up at 5:30 but I stayed nice and dry. I fetched my bear can out of the box, and made coffee in my tent and packed--it's just too cold and wet to eat breakfast outside on the picnic table. 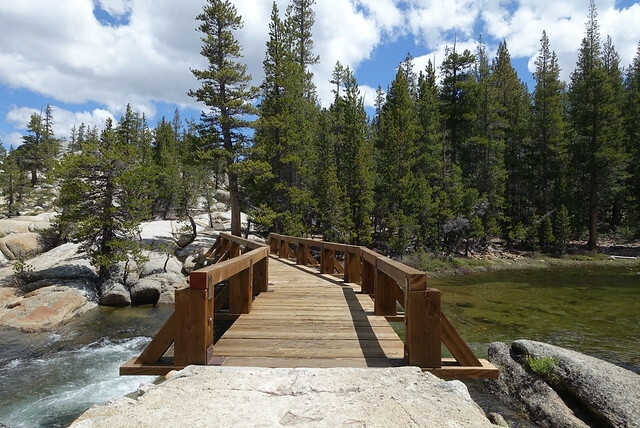 The game plan for today is to get to the Tuolumne grill when it opens at 8, eat a lot of calories, give Chris a call, buy some more food at the store when it opens at 9, then get on the trail for 16 easy trail miles. 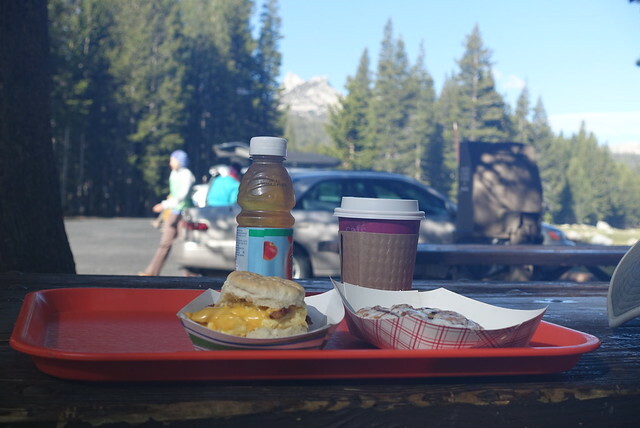 The "grill" is just a fancy name for a, well, tiny little grill, but it did make an acceptable breakfast biscuit with egg and bacon, which I paired with a cinnamon roll and a bottle of apple juice and yet more coffee; that should be enough fuel for the day! The sun had come up--and like the last few rainy days, there wasn't a cloud in the sky this early in the morning--and I sat out front on the picnic tables and chatted with a guy making a sketch of the store. He was another thru-hiker named Ansel... though he did the trail in 1992. 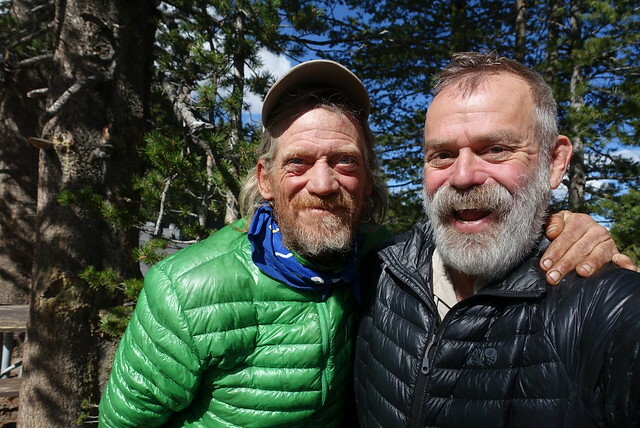 Peter, who was hiking a bit of the California sections of the PCT, joined in, then Rebo showed up as well. We talked a bit about water reports and weather forecasts and trail conditions. Ansel shook his head, and resigningly said "You guys have so much technology now; where's the adventure? Back in the day you were lucky if you even knew tomorrow's weather! " Ayep. I grabbed stuff at the store right when it opened at 9--a dozen Clif bars, a bag of mixed nuts and chocolate, two Knorr pasta sides--shoved them in my pack, and shoved off. 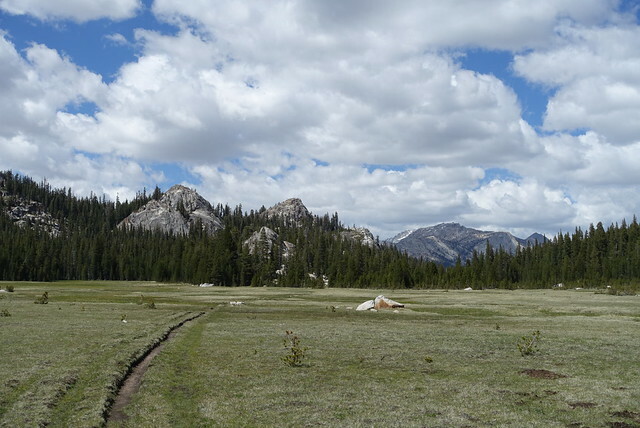 After a brief stop at the Parsons Lodge and Soda Springs (mildly interesting, very mild), I made good time hiking the flat six miles west to Glen Aulin camp, passing two dozen other hikers along the way. It must be the weekend--and not to be too smug, but dangling a pair of one liter Nalgene bottles off your shoulder straps is just a bit overkill. 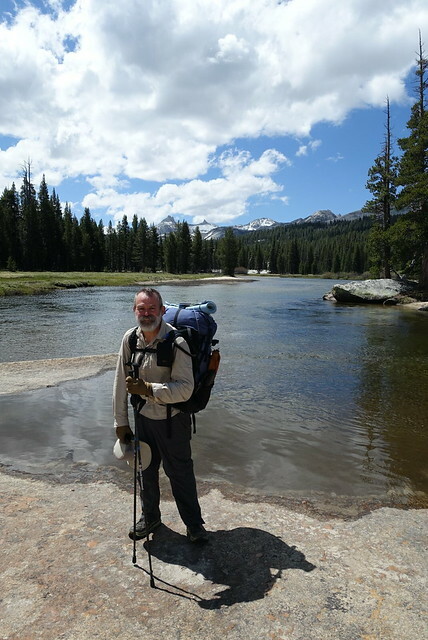 The JMT hikers coming up the slope from Glen Aulin were a bit better prepared, but they still suffered from danglitis as well--Crocs and stuff sacks and sleeping pads and fishing pole tubes and jackets and all sorts of whatnot. I stopped here and there and briefly chatted with a few, yep they were friendly and a bit exhausted after climbing the 4000 feet up from Yosemite Valley, but they had that "we're going to strap everything to the roof of the station wagon and go camping in the Great Outdoors" look about them. OK, maybe that is a bit snobbish of me, but you can do more with less. 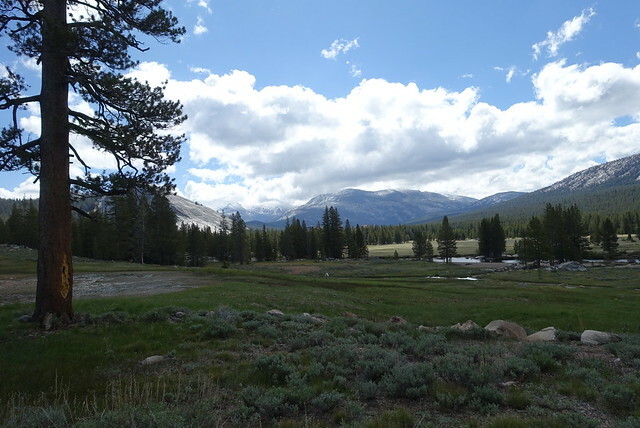 At Glen Aulin, the PCT and John Muir Trail split for good, with the PCT heading north towards Tahoe, about eight days hiking away, and the JMT heading south toward its start at Happy Isles in Yosemite Valley. 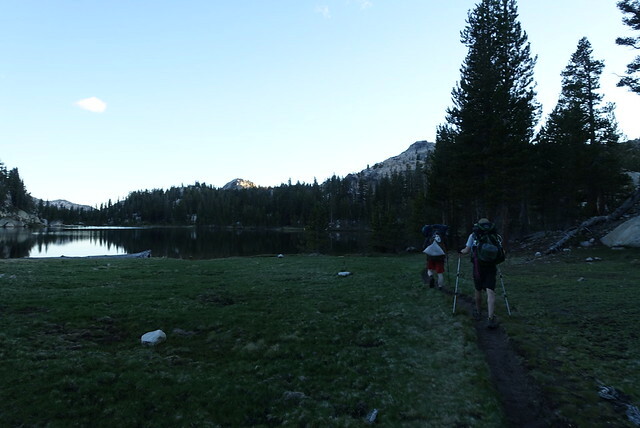 Following the PCT north, there were a lot fewer bootprints, many more pinecones on the trail, and it was quiet and felt... primitive and wild. 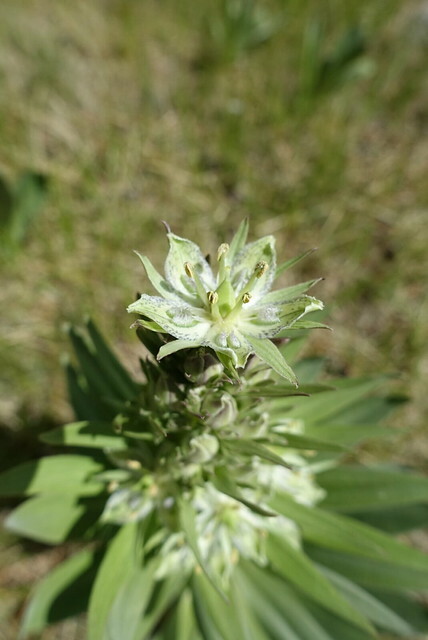 I stopped for lunch and dried out the tent, then continued on through a large and pretty meadow with jagged mountains as a backdrop, taking more than a few pictures. What the pictures won't show is the large number of mosquitos. Northern Yosemite is notorious for the swarms of nasty biters, and though it was cool with a bit of a breeze and some shade, they were still out, with a bite a minute if you stood still. It was enough to motivate me to just keep moving and get ahead of them. The trail was really decent after the last couple of weeks of going up and over passes that were eleven and twelve thousand feet high, it gently ascended to 9200 feet then dropped down into Virginia Canyon, where there were three creeks to ford. I used my water shoes I bought at the Rite-Aid in Mammoth, and felt pleased with my purchase :-) They were comfy and grippy and better than fording those streams barefoot or in my shoes. After the third crossing, the trail turned uphill for two miles though, and it was tedious going. A mile out from Miller Lake I heard "Marmot!" 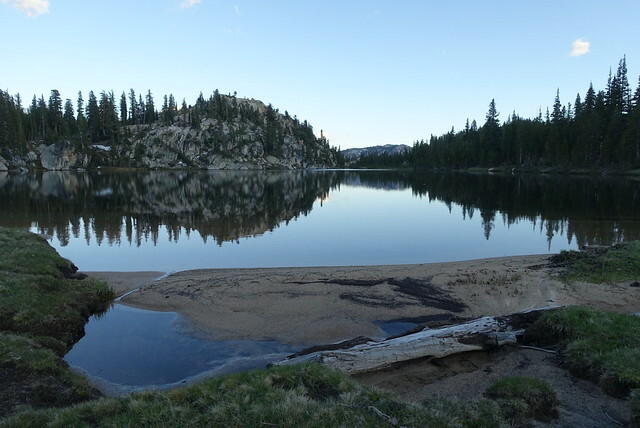 through the woods, and Mike and Pasta from last night caught up and we all camped together at the scenic small lake. We made a little campfire, ate dinner together, and I crawled into bed too late at 11pm. 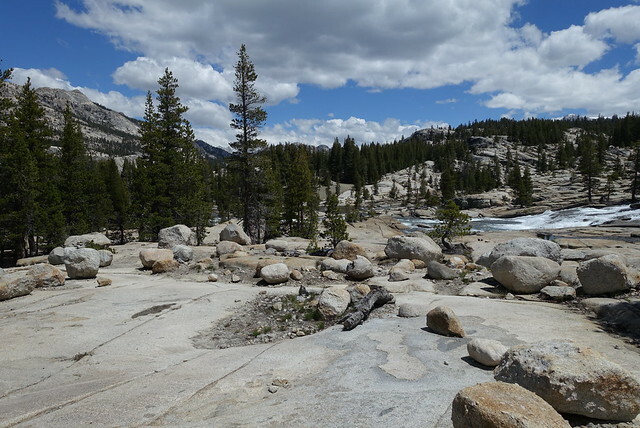 Tomorrow is more of the same--some undulating hiking, up and down, as I head north out of Yosemite. 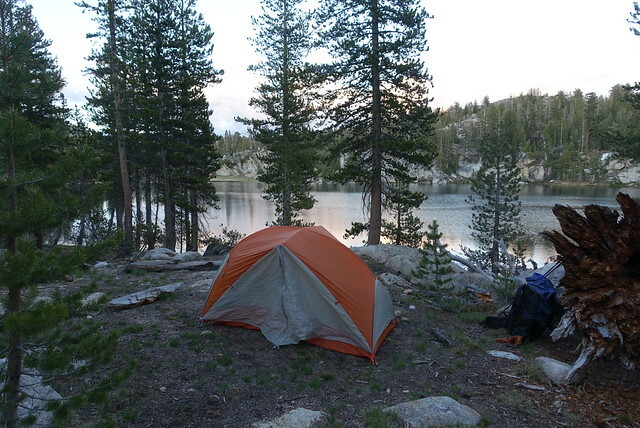 Hopefully I'll be able to camp high enough to avoid mosquitoes. That's really the challenge in this section of the PCT--learning to ignore and avoid the bite-a-minute of these nasty little buggers.